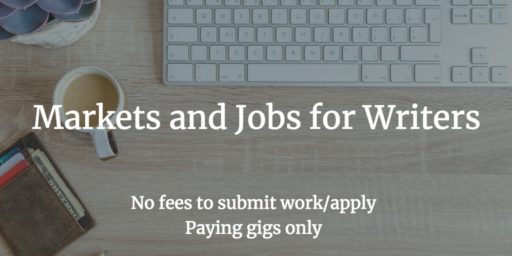 The weekly batch of no-fee, paying competitions, contests, and calls for submissions—plus jobs for those of us who write (especially those of us who write fiction, poetry, and creative nonfiction). These posts are intended to complement/supplement monthly issues of The Practicing Writer newsletter, where you’ll always find more listings, none of them limiting eligibility to residents of a single municipality, state, or province (this blog, on the other hand, does sometimes include those more restricted opportunities). Catapult is currently open for fiction and narrative nonfiction submissions for possible publication on its website. Catapult is also receiving anthology submissions: “Tiny Nightmares will be a collection of short and terrifying tales of monsters, madness, and nightmares. The anthology follows up on Tiny Crimes, an anthology of short crime fiction featuring stories by Carmen Maria Machado, Yuri Herrera, Brian Evenson, Amelia Gray, and more. For Tiny Nightmares, we’re seeking short stories that play with and expand the boundaries of horror fiction — think of the stretch of unlit highway between Jordan Peele’s Get Out, Samanta Schweblin’s Fever Dream, and Stephen King’s IT. Stories that turn our understanding of ‘scary’ on its (trembling) head.” Payment: $100. Deadline: May 1. “Graywolf Press seeks to increase access to publishing by offering a paid, ten-month Citizen Literary Fellowship.” The part-time position is sited in Minneapolis. Deadline: April 30. We’ve reached mid-April; plenty of opportunities listed in the April issue of The Practicing Writer newsletter remain open for entries/submissions/applications. In New York City, the Story Exchange, “an award-winning media organization dedicated to telling the personal and professional stories of women who have started their own businesses, social enterprises and non-profits,” seeks a part-time editorial assistant. “Young Harris College [Georgia] invites applications for a full-time, tenure-track Assistant Professor of Creative Writing position beginning August 1, 2019. Candidates must have earned a doctorate or MFA in Creative Writing by the time of appointment and share a strong commitment to teaching at a liberal arts institution. Our Creative Writing Program is housed within the Department of English. The candidate should possess the requisite knowledge and experience to teach introductory and advanced courses in our creative writing major, as well as composition and literature survey courses that serve the general education core curriculum. Specialization is open to poetry or prose.” NB: There is a similar position announcement at the same institution, with a slightly reduced course load but added program management responsibilities.